3113 Juneau Place is located in the quiet, tree-lined neighborhood of Arcadia. One of the best kept secrets in Baltimore Steps to Herring Run Park & Trails and Lake Montebello. Only a ten-minute walk to Harford Road shopping and eateries such as Red Canoe, Childrens Bookstore, Batch Bake Shop, Zekes, Donut Alliance and Safeway. 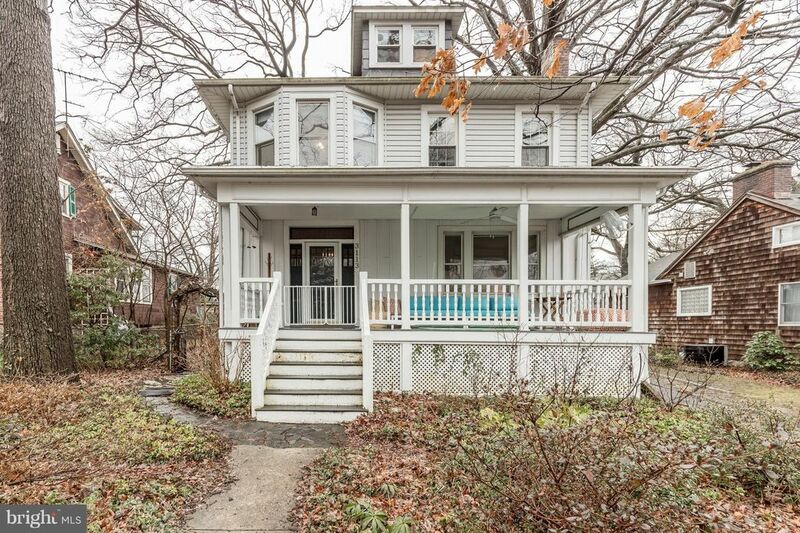 Built in 1925, this spacious Foursquare has over 2600 sq ft of living space on four levels. The first floor offers a spacious entry foyer, large living room, dining room with new French Doors to Cedar Deck, Large Gourmet Kitchen with peninsula for counter seating, quartz countertops, Chef style Wolf Gas Range and Bosch Hood, more storage than you could ever need. Gleaming wood floors, leaded stained-glass windows, unique wood details, built-in china cabinet and wood burning fireplace. The second floor has four true bedrooms and one full bath. The third floor has a newly finished master suite with a luxurious attached master bath and two walk-in closets. The lower level (unheated) has a large knotty pine rec room, laundry room with Bosch washer and dryer, new half bath and a fantastic workshop for all your woodworking or crafting projects. At the front of the house is a large deck (covered porch?) for all your outdoor furniture and at the rear is a large deck accessed from the kitchen or dining room, brick patio and driveway which can easily park 2+ cars in tandem. Large level rear yard with shed. The owners have two electric cars that are charged with a 240v Level 2 charger in the driveway. Warm and cozy hot water radiator heating system, new hot water heater, whole house fan, all new plumbing inside the home, updated electric. Note, there is an additional room off the kitchen which owner had planned to make into a half bath/pantry. It can only be accessed by moving the refrigerator. This lovely home will not last long! Open Sunday 2/24 1-2:30pm.